Before we learn about GSM block diagram first let we check it out what is full form of GSM. 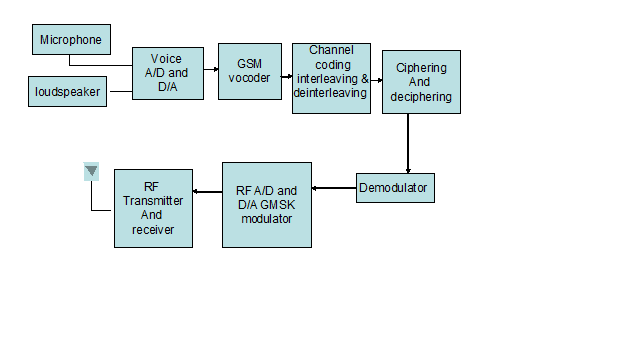 The transceiver antenna transmits or receives the RF signal. The analogue to digital and digital to analogue conversion are done in opposite direction depending on transmission or reception. The microphone and loudspeakers are used in opposite directions. The channel coding is done in opposite direction with the help of interleaving method. Modulation is done by using Gaussian minimum shift keying method. The antenna is MIMO. User authentication is also possible with GSM phones.